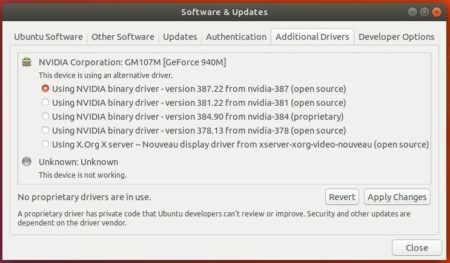 The latest long-lived NVIDIA Linux driver reached the 390.25 release a few days ago. Now you can install it in Ubuntu via PPA repository. Added new application profile settings, “EGLVisibleDGPUDevices” and “EGLVisibleTegraDevices”, to control which discrete and Tegra GPU devices, respectively, may be enumerated by EGL. See the “Application Profiles” appendix of the driver README for more details. It’s NOT recommended to install these proprietary divers unless you know how to restore changes if anything goes wrong. Besides downloading the official .run installers from Nvidia website, the Graphics Team PPA maintains the latest packages. So far, the PPA contains the packages for Ubuntu 14.04, Ubuntu 16.04, Ubuntu 17.10, and Ubuntu 18.04. Input your password when it prompts (no visual feedback while typing) and hit Enter. 2. 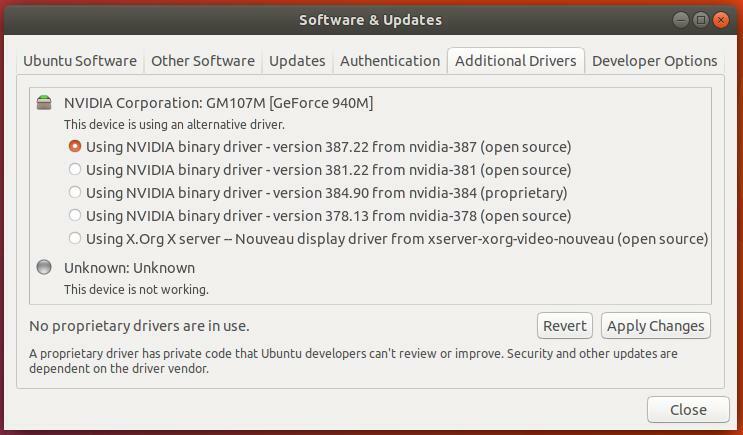 Then launch Software & Updates -> Additional Driver utility, choose the new driver from the list and apply changes. and then start the system through recovery mode.